Mix the cassava starch, flour, sugar, milk powder, instant yeast, mix well. Enter a smooth potatoes, eggs and ice water and knead until blended and smooth. Add butter and salt. Knead again until smooth. Dough rest for 15 minutes. Reduce dough, the dough of each 10 gr. Round it off. Let stand again for 20 minutes, until fluffy double that of the original. 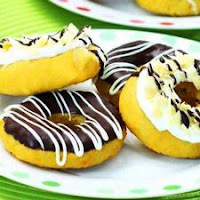 Heat oil over low heat, grab a donut dough, then form rings, enter in the cooking oil while inverted until cooked and golden brown color. Lift. After chilling, dip the donuts into the white chocolate or dark cooking chocolate cooking, sprinkle with almond slices wait until hard. cassava flour used in these recipes are not the same as tapioca flour. Cassava flour is made from dried cassava roots into flour and mashed so. In the market is usually called cassava flour.